Windows 10 includes a new memory compression feature designed to improve the performance of applications. Typically when the physical memory on a PC is consumed, the operating system kicks applications out of memory into a file on your hard drive called the paging file. The location the paging file is stored has much lower performance than physical memory so there is a significant penalty to this behavior. Windows 10 takes a different approach and leverages compression, similar to how we compress files, to keep more applications in memory. Instead of kicking applications out to the slow paging file, a special process will compress the objects in memory so they take up less space. Windows 10 treats traditional apps a little different than new Windows Runtime (Metro) apps. If you look in Task Manager you will see a process called System that seems to grow over time. Don't worry, you are not witnessing a memory leak in progress, it is memory compression at work. This is where all traditional Windows Apps go when their memory is compressed. Microsoft built memory compression into the WIndows Runtime so when their memory is compressed, it shows up with the correct process. 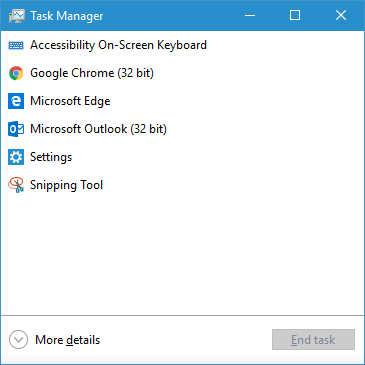 If you would like to see memory compression in action, just open up Task Manager and hit the More Details button. Then, just look for the System item. 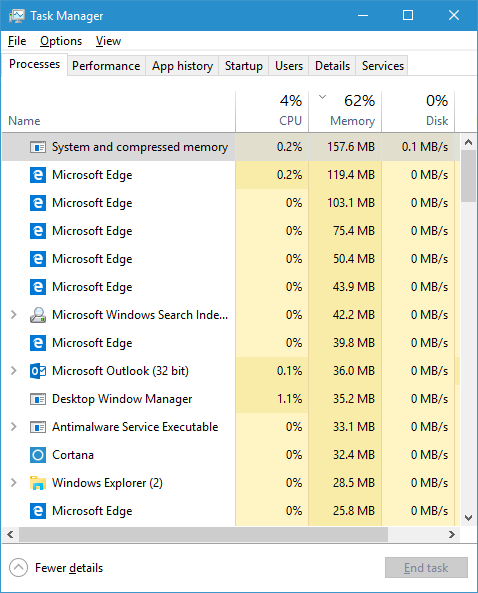 The latest Insider builds of Windows 10 call this System and compressed memory to make it easier to identify. If you would like to learn more about compressed memory in Windows 10, check out this great video on MSDN Channel 9.